Newspaper article from the Courier of 14 March, 1934. 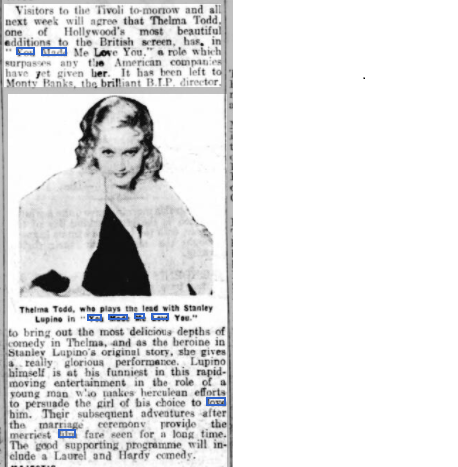 From The Era - Wednesday 10 May 1933. From The Portsmouth Evening News - Saturday 30 December 1933. From the Kent and Sussex Courier of 9 March, 1934. 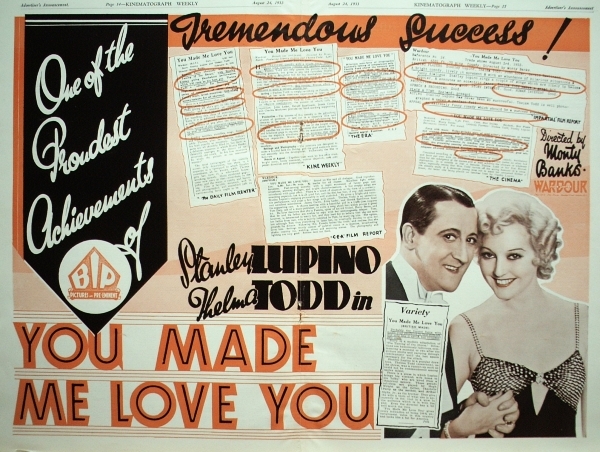 Seldom has Stanley Lupino, that brilliant comedy genius of British films, been seen to better advantage than in "You Made Me Love You,” which will be screened for the first part of next week. He meets and loses his fate in a traffic jam only to discover later that she is the sister of an old school friend and the possessor of an ungovernable temper. 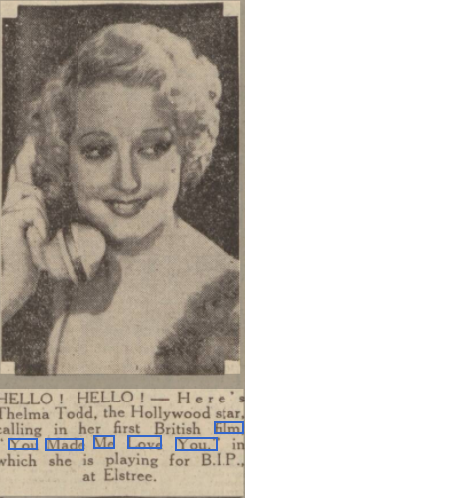 Stanley is partnered by a ravishing Thelma Todd, who gives a glorious performance as the shrewish Pamela, who is led to believe she is able to save her father from ruin by marrying Stanley. He informs her that she’ll never regret it, and she assures him that he will —so begins their married life. Other members of an excellent cast include John Loder, Gerald Rawlinson, James Carew and Charles Mortimer. The supporting film will be "The Past of Mary Holmes," powerful drama, powerfully acted, blended with romance, excitement, suspense and dash comedy. Helen McKeilar plays the principal role with Eric Linden, Jean Arthur and Joan Simpson ably supporting her. 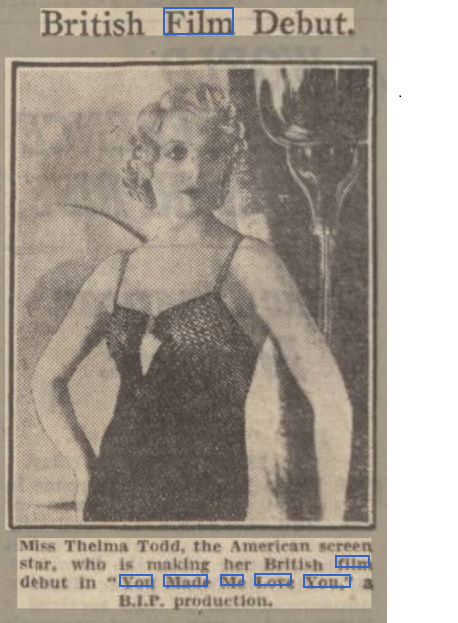 From The Hull Daily Mail - Thursday 22 June 1933. 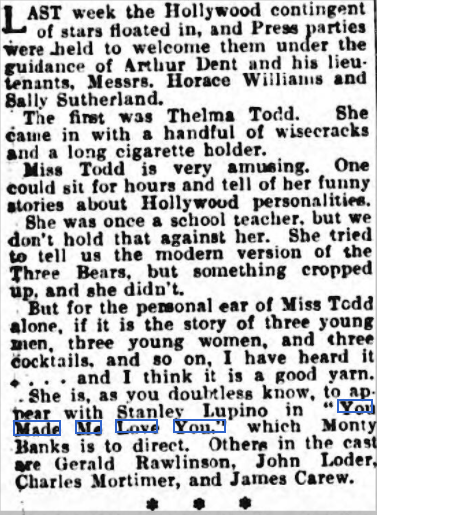 From The Leeds Mercury - Saturday 22 July 1933.